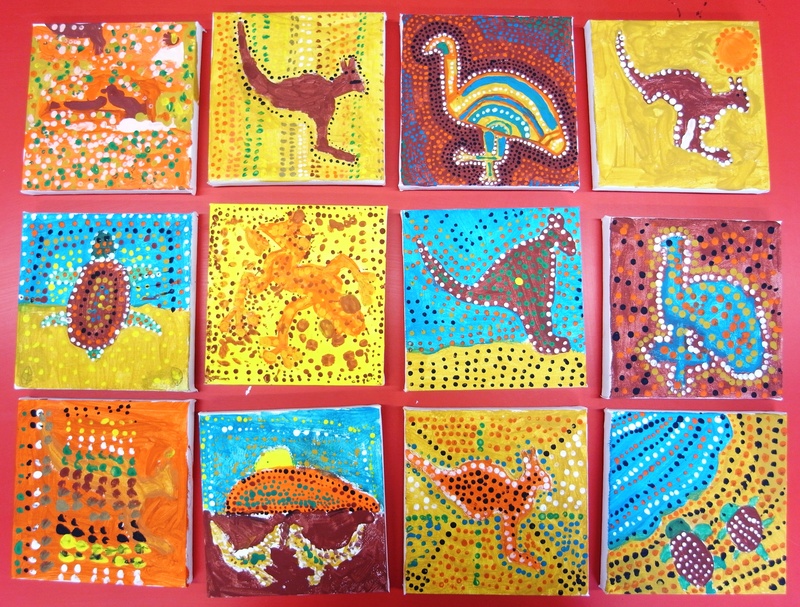 There are many ways for children to recreate the Aboriginal painting style. In this case I gave a group of KS2 children images of Australian animals. They drew a basic outline of their chosen animal onto a mini canvas (quite cheap if you buy online) and then painted the animal and background in solid colours. They then used the end of a paintbrush to carefully add dots in rows, following the outline of the animal. To create larger dots you could use the end of a chunky felt tip pen. 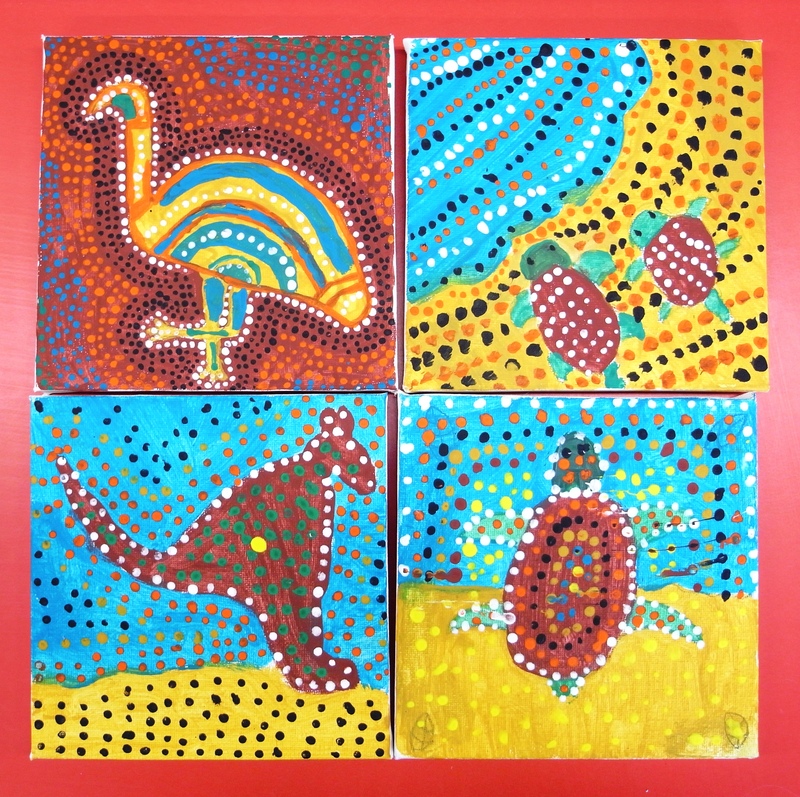 I like to spend time with children beforehand looking at Aboriginal paintings and the colours used. I think it works well to use a mix of more traditional oranges, browns and yellows alongside bright pinks, blues and greens. A white outline can also help a central image to stand out clearly from the background. This technique can be quite time consuming but children are usually very happy with the results. These were a great success! You will need to get hold of some cardboard tubes. I used the tubes you find inside wrapping and other paper rolls and cut them down. 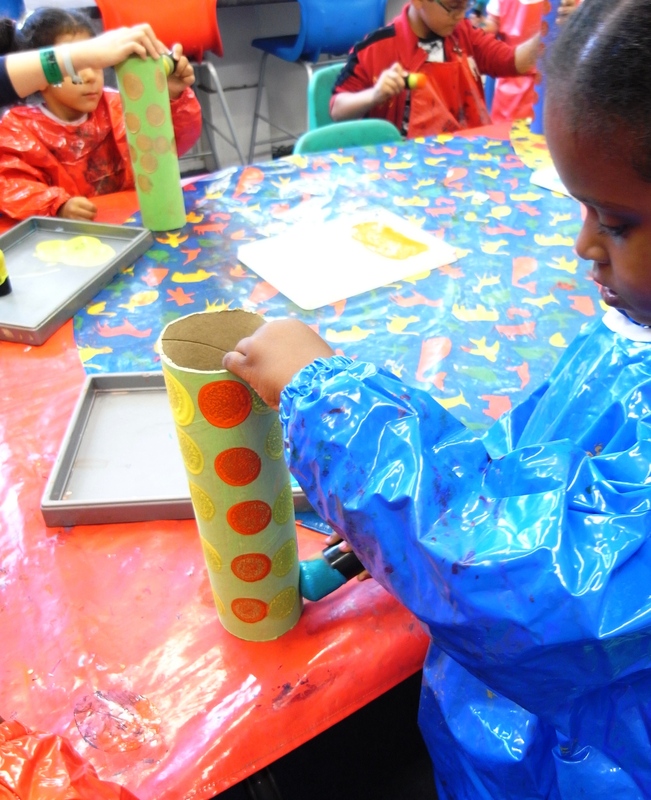 Firstly, the tube needs to be painted with a base colour and then the dots are applied once this is dry. When working with Nursery and Reception age children I used some large round sponges that an be bought from Amazon and some art suppliers. These were great fun to use and easy for them to hold onto. 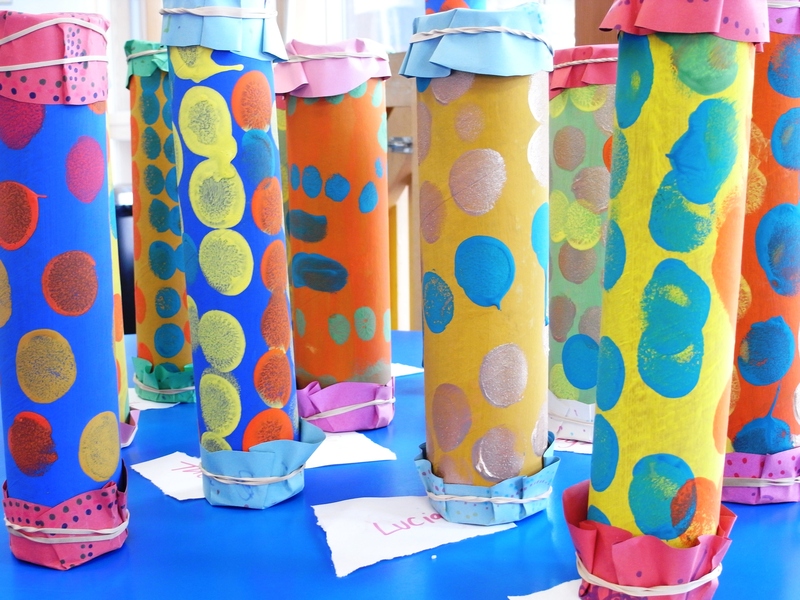 While waiting for the paint to dry I gave the children coloured paper circles on which they created dot patterns using felt tips. 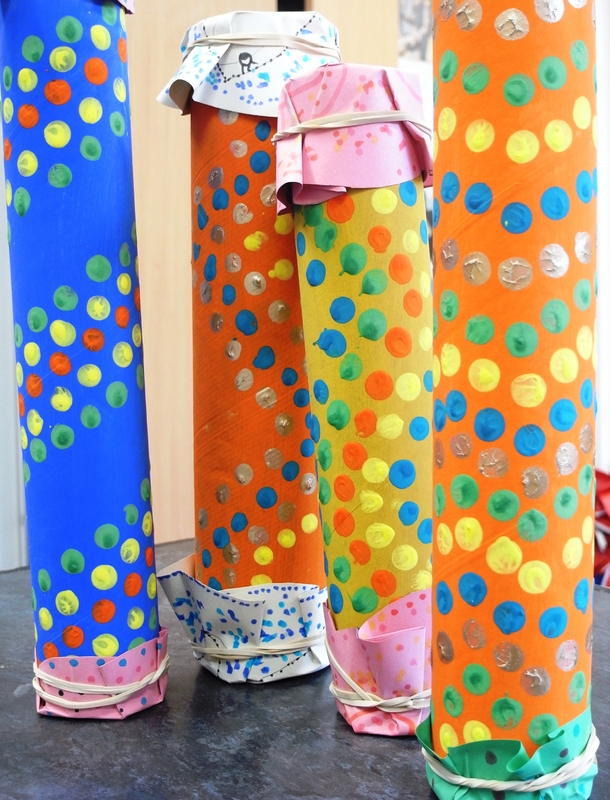 Once dry, we poured rice or lentils into the tube and attached the paper circles onto each end using elastic bands. 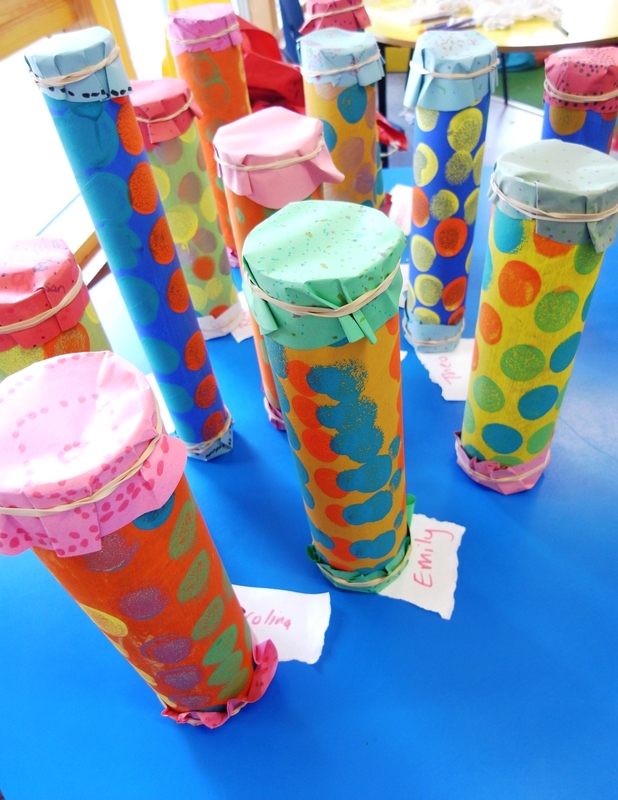 Here are some rain sticks made by older KS2 children using the end of felt tip pens.